The Life of a Stitching Bookworm – This Blog is for sharing my thoughts, passions and ideas. Please feel free to comment, I would love to hear your views. I love reading, cross stitch, old time radio, music, movies/TV esp sci fi/fantasy, tweeting – my Twitter handle is: @Agentfalco if you want to follow me. This Blog is for sharing my thoughts, passions and ideas. Please feel free to comment, I would love to hear your views. I love reading, cross stitch, old time radio, music, movies/TV esp sci fi/fantasy, tweeting – my Twitter handle is: @Agentfalco if you want to follow me. With the Leas just a 20 minute walk from my house on such a lovely day I felt the pull to get out and although it doesn’t look like it in these photos a lot of other people had the same idea. With the sun going down on the sea makes it look quite late but this was only 2.30 in the afternoon. Vines used to grow along the lattice here it is nice to see this area restored and would be a peaceful place to sit with a book. It is fascinating and extremely well told true story of a disturbing and haunting discovery in Bear Brook National Park, New Hampshire in 1985 and the subsequent far reaching consequences. It is not sensationalised and treats the victims with respect told through narration, interviews and detailed investigation. The use of the background music is very effective. I am sure you will be like me and will find this story as gripping as I did and do remain subscribed as this story is still ongoing. 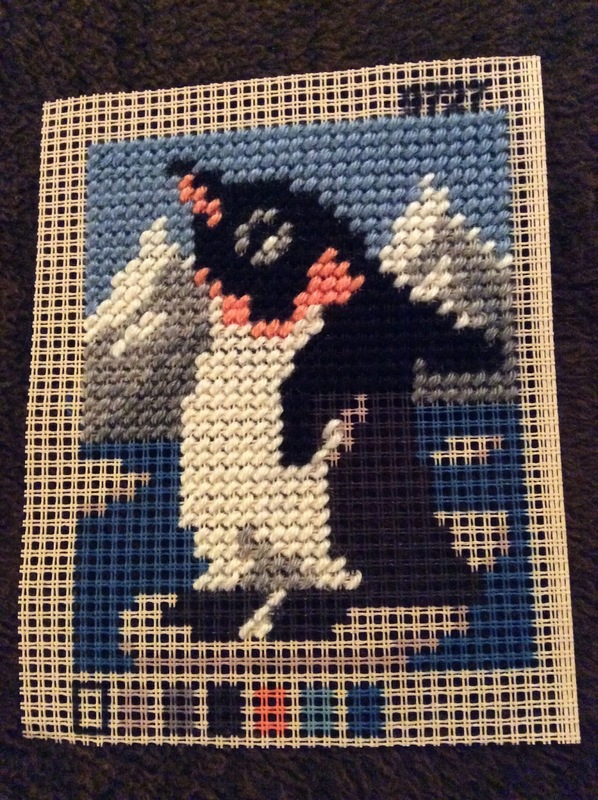 I love the colours I bought it off eBay but it came recommended from a Cross Stitch Facebook group I follow so I saw an actual finished project before I bought it. It is by http://www.sodastitch.com and they produce very professional colourful patterns. It is on 14ct Aida and being stitched with DMC floss. Anyone who has any questions, opinions, ideas please feel free to post a comment. Thanks. I am happy to say that finally there is light at the end of the tunnel of what has been for me a very long tunnel. I have a JOB! It is such a relief, I interviewed at the beginning of July and started working on 20 July. It is a secretarial position at a small firm of solicitors in Hythe so only a short bus ride from home so no long commute anymore which is excellent and everyone has been very friendly and welcoming. The benefits of working local far outweigh any losses from working in London. It is a very busy position but that is great too I just concentrate on what I’m doing and my mind doesn’t have time to wander and worry about other stuff. Travelling to Hythe has been really nice along by the seafront and I get off by the Military Canal every morning. It is great being so close to the shops I can pop into the supermarket before work; there is a library a short walk away and with my bus pass I can now pop on and off the buses locally which is great. I still have to complete my probation but fingers crossed everything seems to be going well at the moment but I have a lot to learn. It’s been a year since I was made redundant and apart from two short periods of temporary work I am still searching. Every interview becomes harder it feels like a part of me is being sucked out and left behind. It is very frustrating I’ve never had a lot of confidence in myself, I read the job descriptions and my heart sinks with phrases such as dealing with high pressure situations and demonstrates proactivity and takes the initiative, etc. The feedback I receive is “we like her but …” normally related to feeling that I am quiet and they worry I won’t be able to deal with the partners/fee earners but I want to scream at them I worked for 27 years as a secretary I can’t have been that hopeless. But I suppose they have to whittle down the candidates and this is the way they do it. I find it hard to sell myself in interviews to find the right phrases to say I don’t have enough STAR stories. STAR = Situation, Task, Action, Result. I’m no good at making things up I can only be myself. Every time the phone rings my stomach does somersaults usually I deal with agencies when they initially contact you they are all confident – oh your CV is excellent we’re get you a job in no time and you know it’s a lie. I decided to switch my focus more towards local jobs it would be nice not to have to travel so far but I’ve have had a couple again they went with someone more suited to the role. For one of the positions I applied for and did an interview, and was told they went with someone else about a week later I got a call from a different agency asking if I wanted to apply for the same role! That was a real boost to my confidence. A lot of the problem is my field of legal work is mainly employment and pensions and for a lot of local secretarial jobs it’s more conveyancing or family based legal work and companies want experience in those areas before they will consider you for interview. I’m willing to travel to other areas of Kent, Canterbury, Tunbridge Wells, Margate, Sevenoaks, Tonbridge, I don’t mind, I’m willing to try a different area of law if someone would be prepared to give me a chance. I really don’t know where to go to from here I keep thinking what else I could do change of career, go back to college, but you need a talent that you can work on and I’ve never been very academic. And my anxiety is playing havoc with my emotions, even when I’m watching TV in the evenings every few minutes I can feel the ache of anxiety in my stomach and the despair just hits you, when am I ever going to get a job again. I suppose I just have to keep plodding along hoping that I’ll get lucky. In June this year I found myself for the first time in my life facing redundancy which although was a shock to deal with emotionally I was not altogether surprised since my role had become quieter and it had become obvious there was less work to go around. It has been an adjustment dealing with this new world of job hunting and especially the daunting prospect of attending interviews since the last one I had was 27 years ago! I have been using outplacement consultants provided as part of my redundancy package and have joined a few employment agencies to help me navigate my way. As a result of my new found status I have found myself far too distracted to concentrate on reading so have picked up my cross stitch needle to help. The last time I did a cross stitch update was in April 2015 far too long ago so it does feel good to be stitching again. 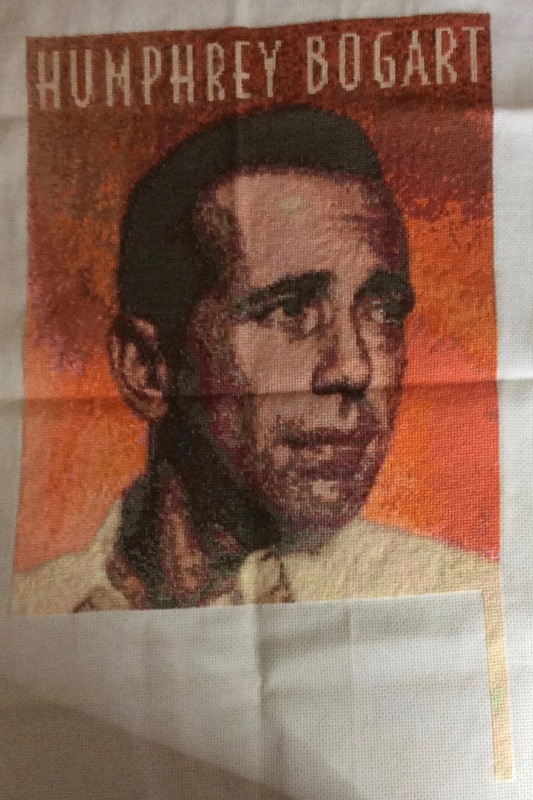 I have made some progress with my Humphrey Bogart project his face is finally complete as you can see. I am pleased to say I am nearing the end than the beginning I have two small sections at the bottom to stitch and have begun the first already though I took the photo before. My Dad is pleased too. The design is by Orchidea and is called “My First Embroidery” it is quite a small piece only 6.5″ x 8″ – I found it slightly difficult to see the difference between the white and very light grey stitches in the colour guide I far prefer working with black and white symbols as you quite often do in cross stitch patterns. But it does stitch very quickly and I’m already over halfway and it looks quite effective. It is nice to have a break every now and then from the tiny stitches I have to do for the Humphrey Bogart piece. Hopefully I’ll have some good news on the job front soon. 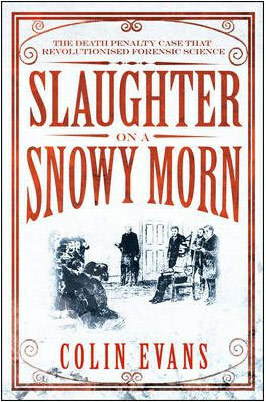 My favourite book was Slaughter On A Snowy Morn: A Tale of Murder, Corruption and the Death Penalty Case That Revolutionised The American Courtroom by Colin Evans which was a fascinating true story of injustice and corruption of those who are suppose to uphold the law but broke it due to laziness and personal ambition. It was a real page turner Colin Evans detailed the characters in such a vivid style and I really enjoyed learning the backstory of each. 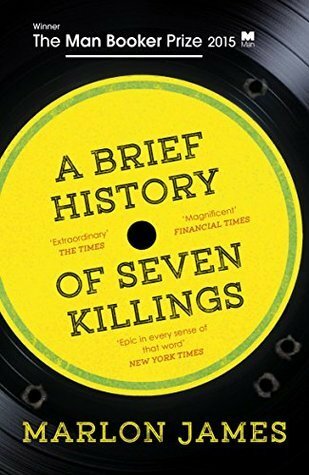 My least favourite book was A Brief History of Seven Killings by Marlon James – sadly it was the first book I read for the book club I joined this year but it was so hard going it was brutal, violent, deeply unpleasant reading and very hard to follow due to the Jamaican dialect it was largely written in. Why is it so often that books which win the literary prizes are so inaccessible.